This chapter lists the steps required to set up JRebel remote server support for Eclipse. You need a working, activated JRebel installation in your IDE. Please follow the instructions on how to install and configure JRebel for Eclipse. Running JRebel on a remote server requires the JRebel agent and a special launch parameter. Follow these steps to do this. Download the standalone JRebel archive and extract its contents. Upload the contents to the remote server and make a note of their location. Add -agentpath:[/path/to/]JRebel library attribute to the server startup parameters. Select the correct JRebel library based on the remote server operating system and architecture (read more here). This guarantees that JRebel is started with the server. Add the -Drebel.remoting_plugin=true attribute to the server startup parameters. To enable JRebel password authentication on the server, use the -set-remote-password <NewPassword> CLI command. Doing this will require all connecting JRebel IDE plugins to be configured with the same password for successful synchronization. JRebel:  (c) Copyright ZeroTurnaround AS, Estonia, Tartu. JRebel:  Server is running with JRebel remote server support. Server name – Provide a name for the remote server. Server URL – Provide the full URL for the server. This field is required. Server authentication – Enable additional synchronization security. Specify a simple alphanumeric password. The password also needs to be set on the server: java -jar jrebel.jar -set-remote-password <NewPassword>. HTTP Basic authentication – Enable HTTP authentication when your remote server requires it. Press Test connection to immediately test the server URL. This test will ping the server for JRebel, verifying its presence and correct version. 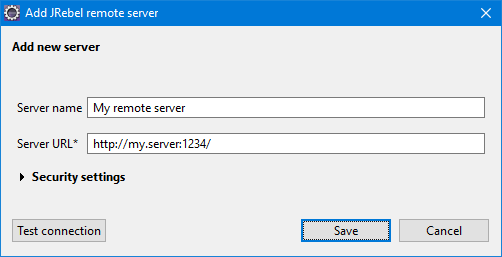 Press Save to store the new remote server. This server can now be used by all projects in your workspace. Any new servers added from this view are automatically enabled for workspace synchronization. To disable a workspace server, deselect the checkbox in front of the server name. Select the checkbox for your project. The configuration file rebel-remote.xml is created in the project resources folder. Build and redeploy your application containing the rebel-remote.xml configuration file to the remote server. By default, all configured projects inherit the workspace server settings. Off – No remote server synchronization functionality is applied to the project. Use all active workspace servers – Once remote servers have been defined and enabled via Help > JRebel > Configuration > Remote servers, all of them will be used for synchronization of this project. This option provides a simpler configuration when working with just one remote server or when the project is deployed to all remote servers. 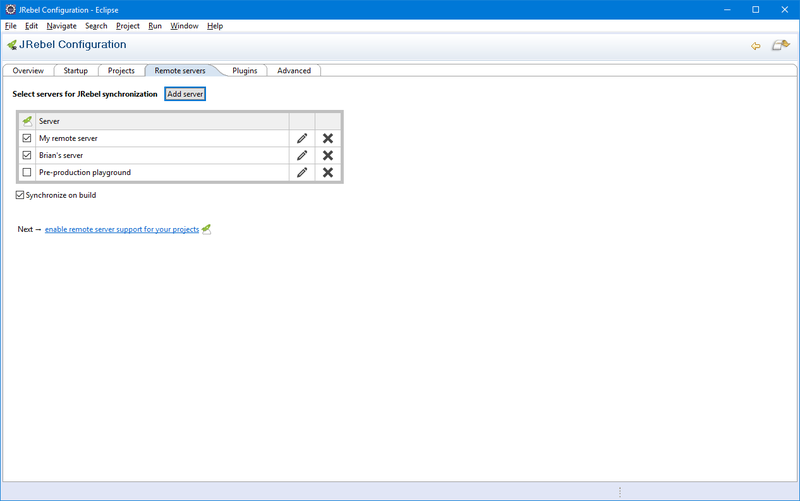 You can use the global Remote servers view to enable/disable servers for all projects configured with this option. Select specific workspace servers for this project – Select or deselect remote servers in the table to enable them for the project. This project will be synchronized only with the selected servers. Note that enabling or disabling remote servers in the global Remote servers view has no effect on projects using this configuration. As of JRebel 6.4.8, any previous project-specific settings will be automatically converted to configurable workspace servers. Use the synchronization button on the toolbar to manually synchronize all configured projects between your workstation and server. To synchronize a single project, open the drop-down menu next to the button and select the desired project. You can also right-click the desired project node in the Project Explorer and select JRebel > Synchronize from the context menu to synchronize. Your synchronization status is displayed in the console log.